Located in the southwest of China, Chongqing is a major city covering an area as large as Austria. As the only of China’s 4 municipalities located in the country’s west and home to a population of 30 million, it serves as a major economic and transportation hub. 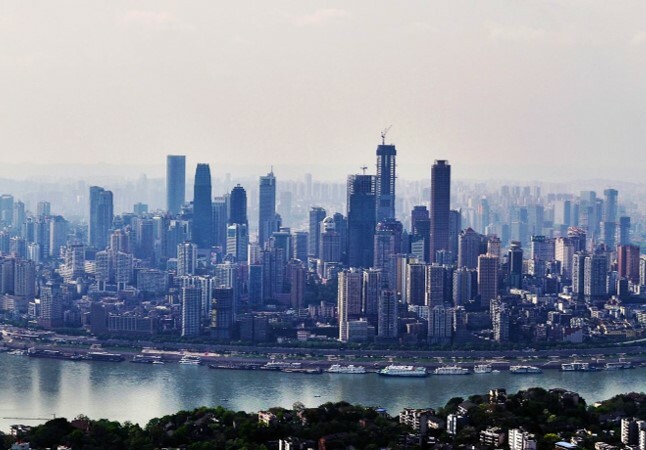 Despite rapid economic growth transforming the city into a major metropolis, Chongqing has held on to its rich and interesting history and culture, which is displayed in museums, ancient streets and traditional areas around the city. Best known for its fiery cuisine, Chongqing is recognised across China as having some of the hottest (and most delicious) food around – a dream for any spice lovers looking to dive into big city life in a more unique destination. Available as a city option on our TEFL Training Programme, a placement in Chongqing will see you working in a state funded primary, middle or high school or a university. Classes will consist of around 50 students and last for around 40-45 minutes. Depending on your specific school type, you can expect to teach between 15-25 classes per week (Mon-Fri), with office hours and lesson planning time scheduled around this. Basics like a blackboard, computer and a projector to display your PowerPoint will be supplied, however little else will be provided, so you’ll have to bring certain supplies yourself. Last minute changes are common in state schools, so you will need to be ready to adapt if your teaching schedule changes. While knowledge of Mandarin isn’t necessary it is certainly helpful, so we advise learning some basics in preparation. Our Chongqing teaching placements include accommodation in a furnished apartment, provided by the school. This will be located either on campus or in a nearby location, making it easy to commute. Apartments are equipped with all the essentials, including a shower, kitchen, western toilet, fridge and freezer, and a washing machine. The school will not charge you rent, and bills are usually covered as well. This will be confirmed in your contract. Your school will most likely offer food during the weeks, but on weekends you will need to eat out or cook for yourself. Depending on the size of your school, you may be required to work in more than one location in the city. This will be indicted to you prior to your arrival, and both teaching sites will be within reasonable distance from your accommodation. Chongqing’s long history, rich culture and growing economy combine to provide no end of things to see and do. The city itself is home to numerous attractions, and its western location means it’s also surrounded by places of stunning natural beauty that make for great weekend getaways. 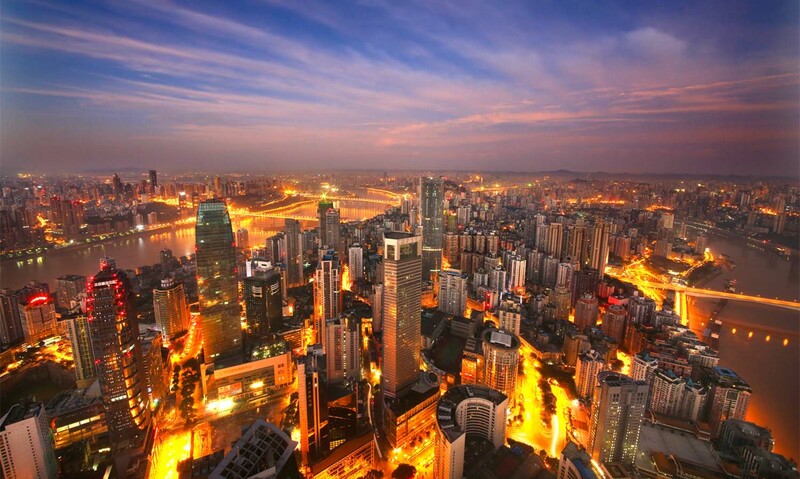 Jiefangbei CBD: Chongqing’s bustling CBD is the most prosperous and busiest of West China, and well worth a visit. Covering an area of 36,000m2, this Pedestrian Street is lined with shops, restaurants and bars that draw in crowds from far and wide. If you’re looking to get a true sense of China’s megacities, this is the place to go. Hongya Cave: One of the cities most popular attractions, Hongya Cave is a large stilt house complex built on the side of a cliff overlooking the Jialing River. The complex is populated with shops selling local products and tourist items, as well as restaurants and bars that offer unbeatable views of the river, particularly at night when the skyline lights up. 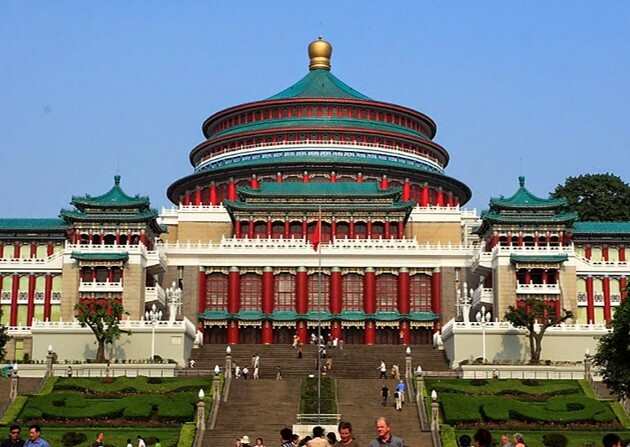 People’s Assembly Hall: Standing across from Renmin Square, the People’s Assembly Hall is a landmark so striking that it has come to be known as one of the ten cultural symbols of Chongqing. Its large size and traditional Chinese architecture demand your attention and make for excellent photos! The square is also a great place to wander around and enjoy watching locals practicing taichi, dancing or playing mahjiang. Ci Qi Kou: Chongqing’s ancient area of Ci Qi Kou boats over 1,700 years of history, dating back to the Ming and Qing Dynasties. 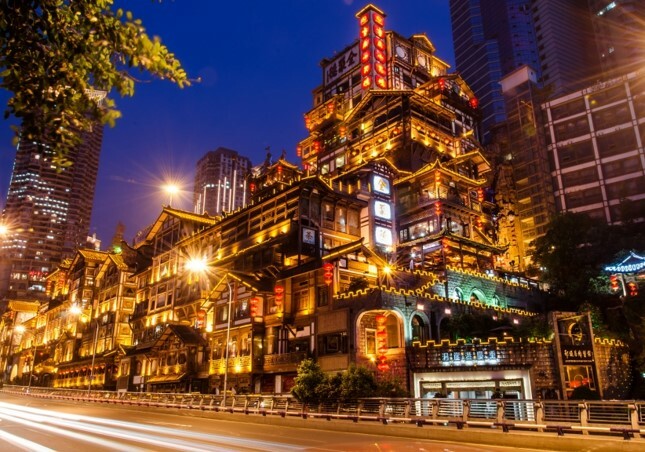 Despite the city’s rapid economic development and transformation into a modern metropolis, this area has maintained its traditional architectural design, making it a great place to explore to get a taste of what Chongqing was once like. Formed of numerous winding streets that cover an area of 1.2 square kilometres, it’s a great place to get lost! As a branch of the world-famous Sichuan cuisine, Chongqing dishes are popular across China. Chongqing locals are known as being big eaters, so you’re guaranteed to find a great selection of restaurants wherever you are in the city. Spice lovers will love Chongqing, but don’t worry if you can’t handle it – you can always ask for less spicy! Below we’ve listed some of the top local dishes you need to try. Chongqing Xiao Mian: This numbingly spicy noodle dish is hugely popular, and it’s not hard to see why. The concept is simple; thin noodles are boiled in a deep red-coloured soup (that’s just as hot as it looks), along with peanuts and seasoning to give the dish an extra flavour – if you can get past the spice. Hot Pot: A classic Chinese dish, different style hot pot dishes feature on menus across the country. In true Sichuan style, Chongqing hot pot is extremely hot, containing both red chilis and Sichuan peppercorns. Simply choose your vegetables and meat and get cooking! MaPo DoFu: Vegetarians need not worry about missing out on delicious local cuisine with this signature local dish. Chunks of tofu are cooked in a hot sauce along with various vegetables to form this signature dish that’s loved by many across China. Chongqing Saliva Chicken: It might not sound it, but Chongqing Saliva Chicken is a deliciously refreshing dish. Served cold as a kind of appetizer, the dish is made from sliced chicken and a spicy broth – well worth a try if you can get past the name! As a true modern metropolis, Chongqing’s entertainment scene and nightlife won’t disappoint. Home to numerous bars and clubs, as well as vibrant local restaurants and river tours, the city has something to offer everyone. If you’re looking to relax and unwind after a day at work, Nan Bin road is the place to go; bars, restaurants and clubs line the street, giving you plenty of choice. Hongya Cave comes alive at night, and a trip here at night offers spectacular views over the river and the city skyline. Besides typical nightlife, Chongqing is also home to shopping centres, cinemas and parks that offer a great escape from the hustle and bustle. Interested in teaching English in Chongqing? Check out our State School Teaching Programme, or apply now to kickstart your career in and explore China’s least known but most up-and-coming megacity.